As the Delta smelt moves closer to the abyss of extinction, Interior Deputy Secretary David Bernhardt, President Trump’s nominee for Interior Secretary, has been working on rolling back Endangered Species Act (ESA) protections for the Delta Smelt. This is a policy change that directly favors his former client, the Westlands Water District, the largest agricultural water district in the United States, according to a breaking New York Times story. According to a story I broke here in January, a fish survey that the California Department of Fish and Wildlife (CDFW) conducts every autumn turned up zero Delta smelt - the very same fish that Bernhardt is trying to strip protections for — throughout the monitoring sites in the Sacramento-San Joaquin River Delta in September, October, November and December 2018. “Although Bernhardt claims he was allowed to work on the issue after receiving verbal approval from Interior Department lawyers, independent ethics specialists quoted in the story say his working on a policy that would disproportionately benefit a former client is a clear conflict of interest,” according to a news release from the Western Values Project. “The policy change directly benefits Westlands Water District, and is what Westlands paid Bernhardt to lobby on when he was their lobbyist. 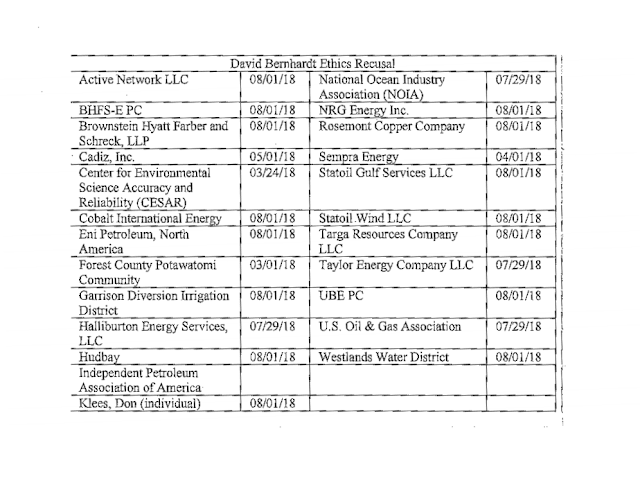 Before Bernhardt began at Interior, the story reports, Westlands paid Bernhardt’s former firm, Brownstein Hyatt Farber Schreck, at least $1.3 million in lobbying fee, according to Saeger. “Westlands Water District appears on David Bernhardt’s recusal note card, which he carries around with him while he’s at work so he can keep track of which former clients he isn’t allowed to work with,” noted Saeger. The group filed the original Freedom of Information Act (FOIA) request filed on May 4, 2018. The court recently ordered the department to provide a status report to WVP on the public records by February 22.
in 2018, WVP launched davidbernhardt.org in order to keep track of Bernhardt’s numerous conflicts of interest. The exposure of Bernhardt’s enormous conflict of interest takes place at a critical time for Delta smelt, salmon and other San Francisco Bay Delta fish populations. For the first time ever, a fish survey that the California Department of Fish and Wildlife (CDFW) conducts every autumn turned up zero Delta smelt throughout the monitoring sites in the Sacramento-San Joaquin River Delta in September, October, November and December 2018. White also said another survey, the Enhanced Delta Smelt Monitoring (EDSM) survey, caught 13 Delta Smelt during December. (https://fileshare.fws.gov/?linkid=KZi4zr6VWWXpAmKqe8kAlLwMpNbkSIFi8YDODS6 ncAGbVD1eD7Lrjg). While decades of water exports and environmental degradation under previous governors and federal administrations have brought the smelt, once the most abundant fish in the Delta, to the edge of extinction, Governor Jerry Brown and his administration did nothing to reverse the trend, but only helped to worse the endangered fish's status, according to fishermen and environmentalists. Governor Brown’s legacy: several extinctions of fish? Dr. Jonathan Rosenfield, the Lead Scientist for The Bay Institute, emphasized in a tweet that Delta smelt are "not extinct," since other sampling programs still catching them. "Extinction is not imminent (if agencies take action)," he noted. "'Flexible”, 'adaptive' implementation of the ESA (Endangered Species Act) has not worked. It's time to enforce protections." Found only in the Sacramento-San Joaquin River Delta, the Delta smelt mainly inhabits the freshwater-saltwater mixing zone of the estuary, except during its spawning season. That's when it migrates upstream to freshwater following winter "first flush" flow events, around March to May. Background from CDFW: The California Department of Fish and Wildlife has conducted the Fall Midwater Trawl Survey (FMWT) to index the fall abundance of pelagic fishes nearly annually since1967. FMWT equipment and methods have remained consistent since the survey inception, which allows the indices to be compared across time. These relative abundance indices are not intended to approximate population sizes. However, we expect that our indices reflect general patterns in population change.